Connie's World Adventure! : Jerusalem, Israel: The Holy Land! Jerusalem!! I remember like 10 years ago, I was on a plane somewhere and they were playing an Israel tourism hype video and there was nothing else to watch so I sat there and watched it play through twice. 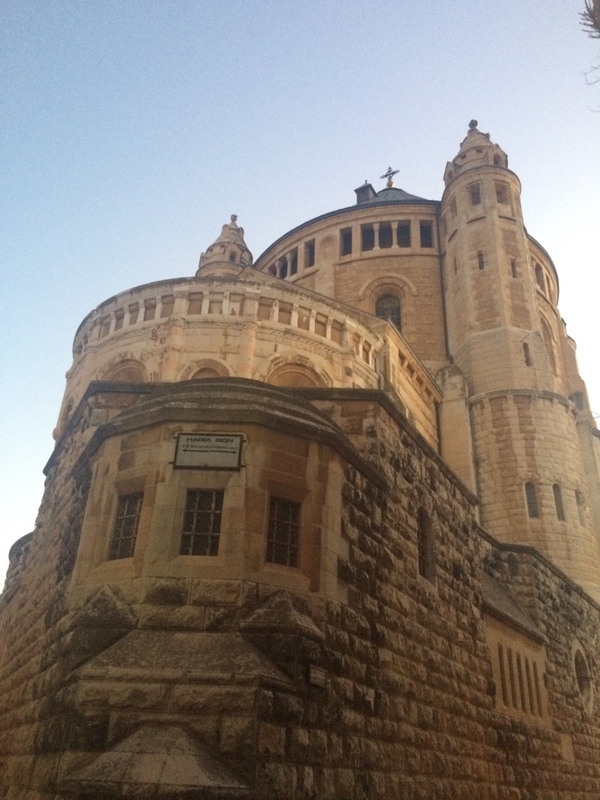 This country is such a fascinating place and the birthplace of so much religious and cultural history. Jerusalem? 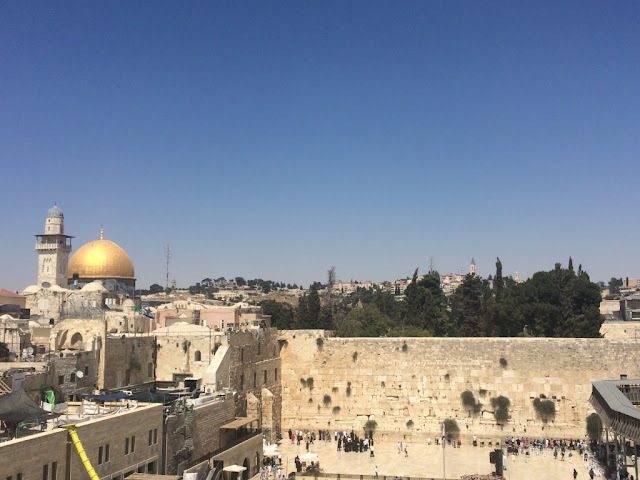 Only the holiest city for Judaism, Christianity, and incredibly important to Islam as well. Tons of religious history from the Bible.....and obviously with that, comes lots of historical conflicts as well. 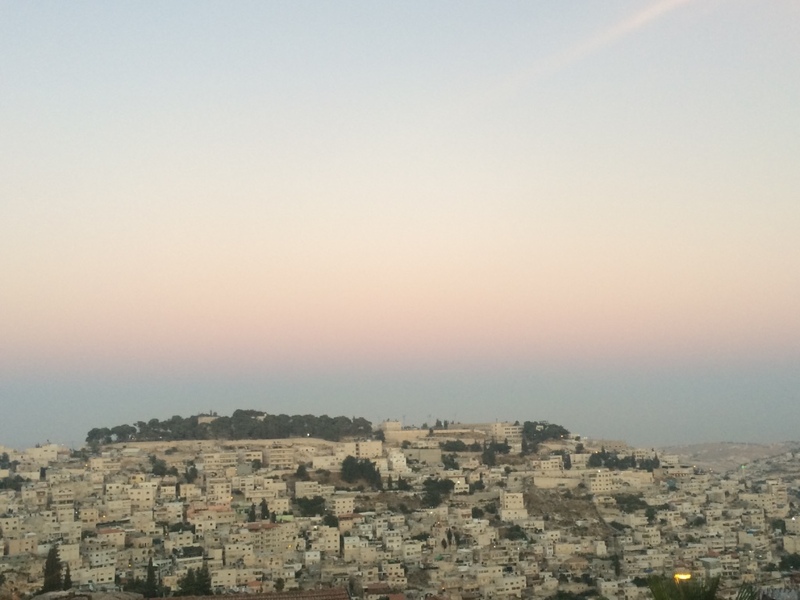 We stayed in Jerusalem's Old City, which is divided into four quarters - Jewish, Christian, Muslim, and Armenian. Each quarter has its own distinct feel and community - our guide said 99% of people who live in each quarter actually belong to that subset (i.e. you won't find a Jewish person living in the Muslim district, etc.). 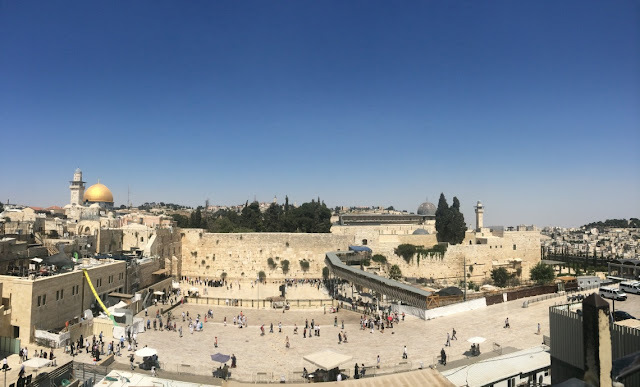 The ones who actually live in the Old City usually live in places that have been passed down in the family for generations, and/or are the most devoutly religious followers who want to be as close to the holy sites as possible. 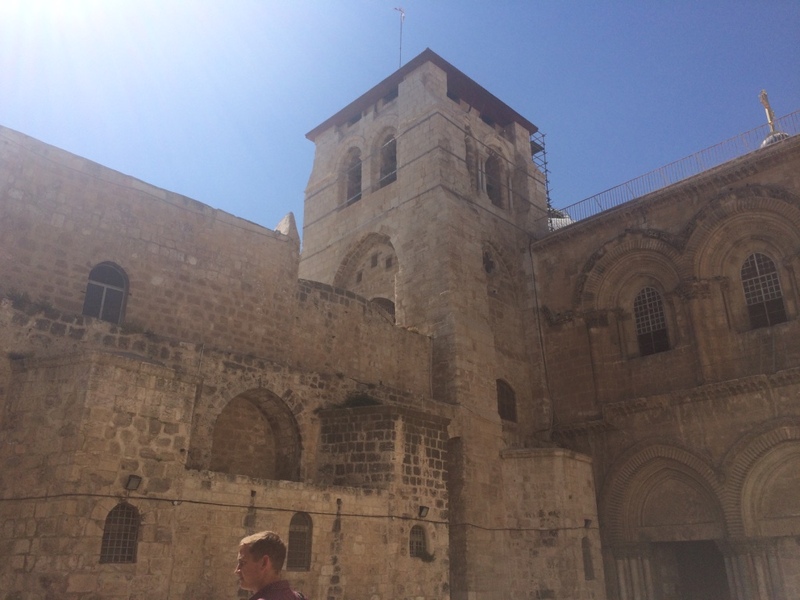 Inside the Old City are famous religious sites such as the Tower of David, the Western Wall, Church of the Holy Sepulchre, Dome of the Rock, Stations of the Cross, Mount of Olives, etc. Took an hour-long bus ride from Tel-Aviv to Jerusalem. 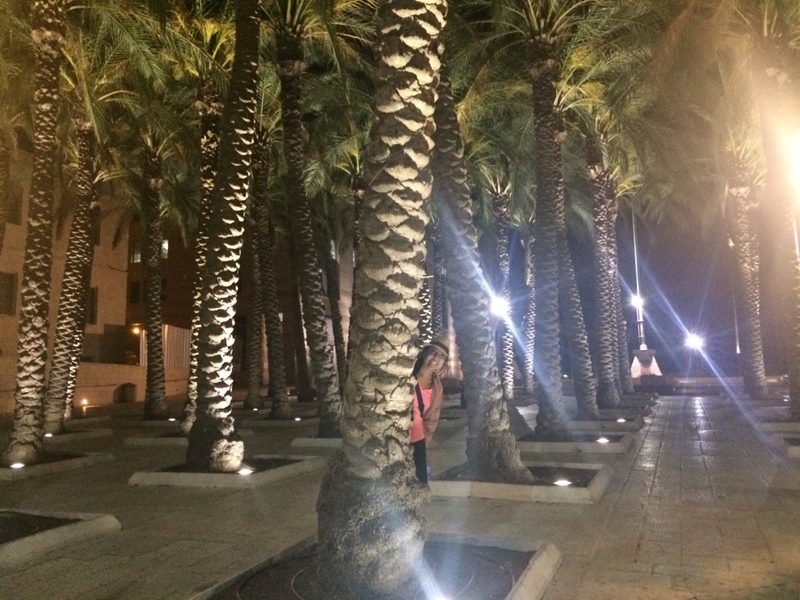 Navigating to our hotel wasn't too bad, but it definitely wasn't the easiest. First observation is that people generally don't go out of their way to be helpful to tourists, and despite the fact that most people speak English, a lot of the signage is only in Hebrew. But we made it. Did the Sandeman's free walking tour - this was my third one (the first two being Dublin and Prague), and I generally love the guides because they are great and have really good energy. 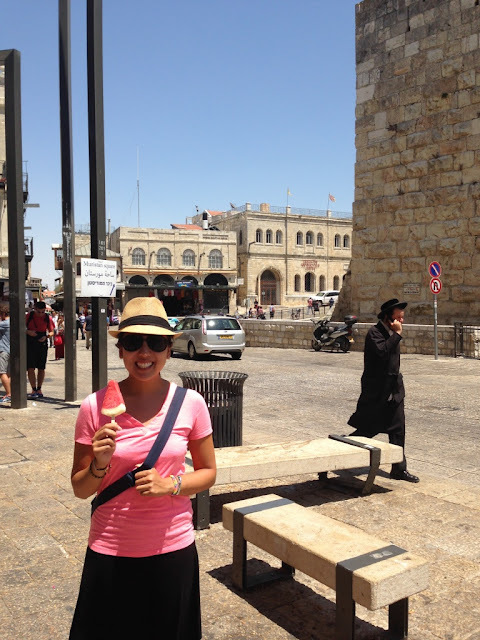 Our tour was 2 hours and covered a general overview of the Old City. It was super informative, and there was so much information given that a lot of the history here is super convoluted. I was having trouble keeping track of the different religions and events and dates (because we're talking like, 2,000 years ago here, not a couple hundred). It's crazy to me that some of the places we visited and saw are things you've read about in the Bible. CRAZY. Like, when the guide points to a pile of rocks and goes "This is supposedly where Jesus was crucified," you have no idea how to feel or react or what to do or how to believe it's real life. This is the Cardo, or the ancient "heart" of the old Jewish Quarter (hence the term cardiology). This used to be the main street, and now part of it is preserved a couple meters below today's newer Jewish Quarter streets. 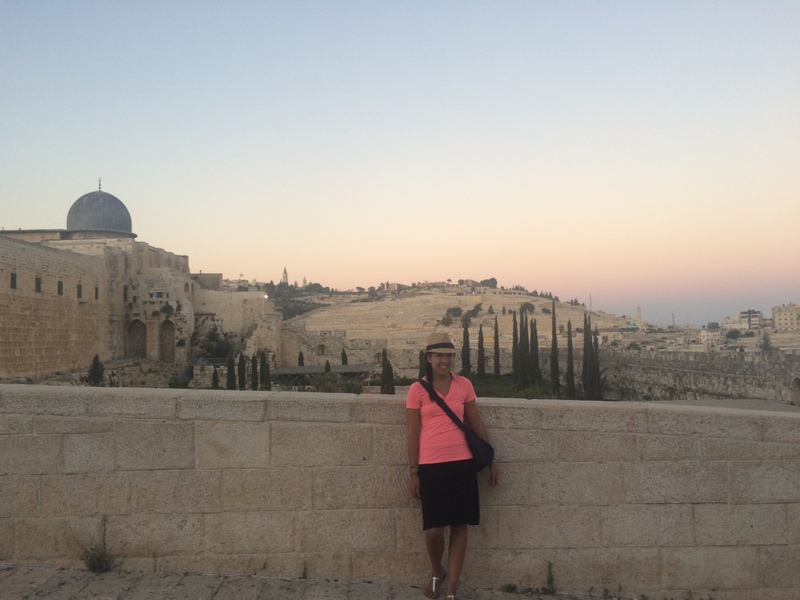 The golden dome is the Dome of the Rock, where Jewish believe Abraham prepared to sacrifice his son Isaac, and the bushes next to it is Temple Mount, the holiest site in all of Judaism and where Jewish people turn in the direction of to pray. 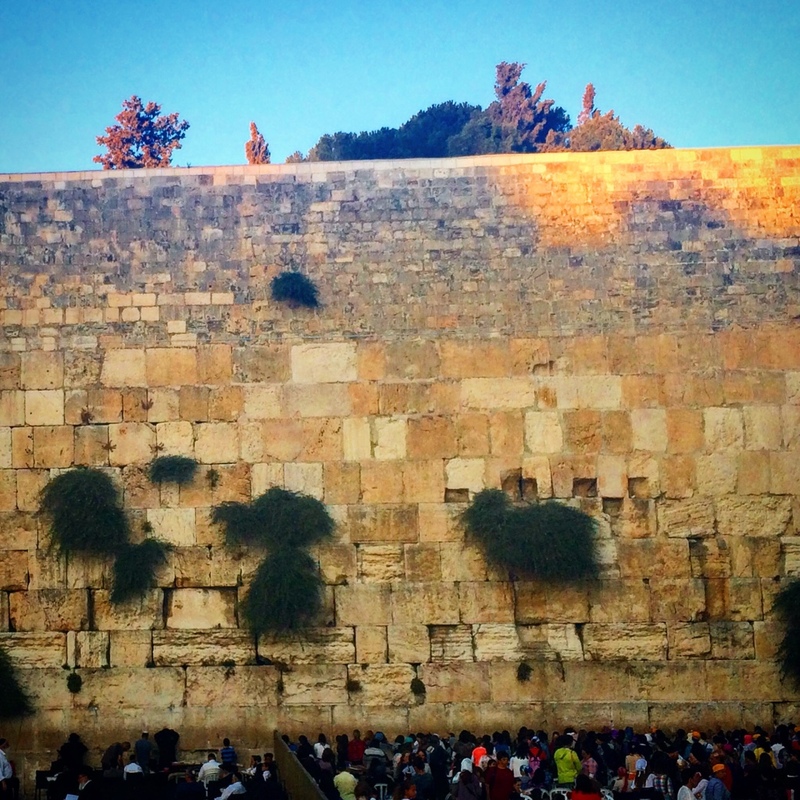 Hence why the Western Wall faces that way and people pray at it. 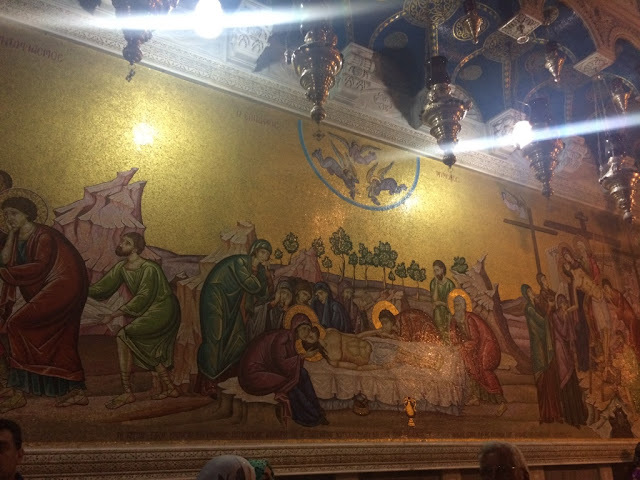 Post-tour, Drew and I went to see the Church of the Holy Sepulchre, which is the most important site in Christianity, as it is where Jesus was thought to have been crucified, and where his tomb lies. The church is a crazy mix of beliefs and faiths, as a bunch of different groups have ownership of different parts of the church and control their specific altars, so it's kind of a mish-mash. Also, not a single sign explaining a single thing. If you didn't know the significance of the church, it'd be super easy to walk right on by the nondescript building, or even to walk in and look around and walk out having no idea you'd seen anything out of the ordinary. That blows my mind. 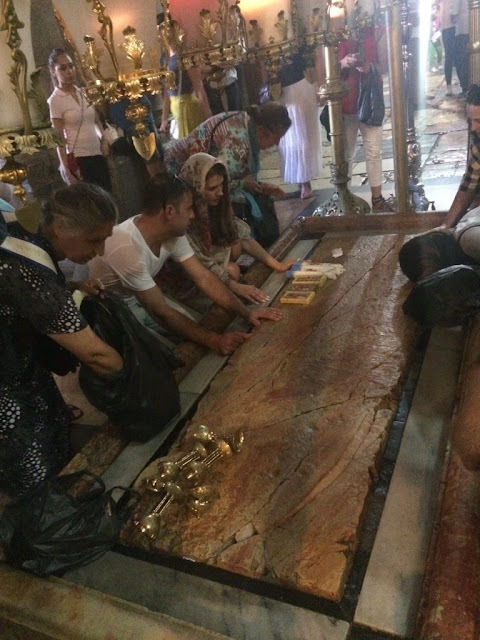 This stone is where Jesus' body supposedly lay before his burial. 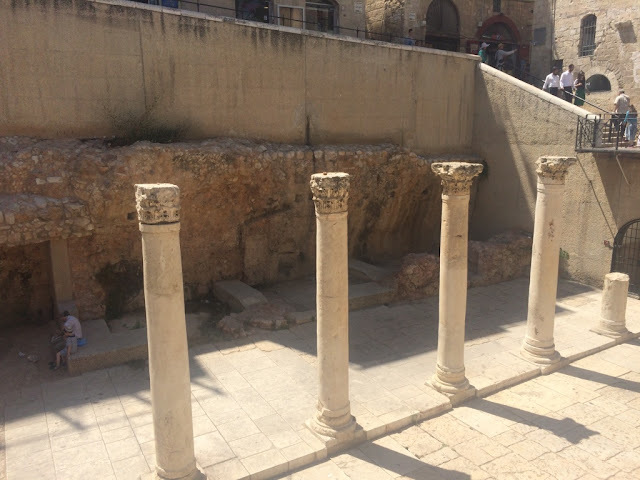 Which is funny because guides will tell you that the stone only dates back a couple hundred years so it isn't possible that it's the stone - but again, in Jerusalem - tradition trumps facts. People still come and lay objects on it, pray on it, and touch it. 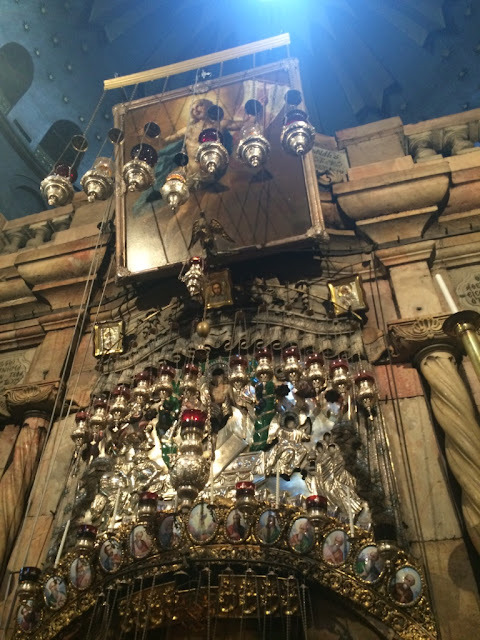 AND THIS IS JESUS' TOMB. There was a long line to get inside, as it only fits about 3-4 people inside at a time. And there were a ton of ceremonies and things going on that held up the line. If I could describe it in two words: pure chaos. 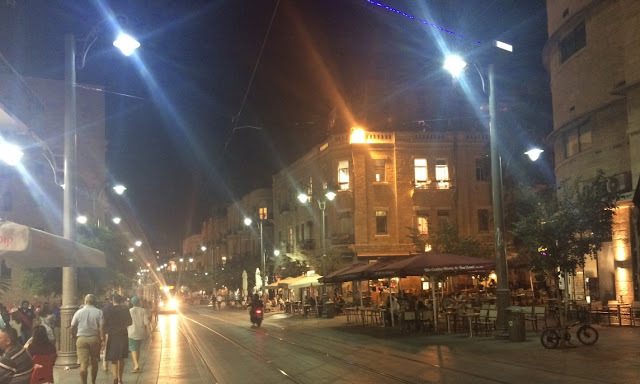 At night, we left the Old City and entered the main district of Jerusalem - this was like a complete departure from the Old City. It was much, much more Westernized, and there were a ton of restaurants and bars and nightlife and English-speakers. Which is good, because I was starting to feel that my long skirt was the shortest skirt in the world after seeing what people were wearing in the Old City. I touched on some of this above, but being a tourist here is weird. You get this sense that these religious sites are intended for tourists that are here for religious purposes or already know what's going on. Most places aren't super tourist-friendly - there's no signage or information people or helpful employees or translations. It's like - if you're here, you should know why. Maybe I've been spoiled by the overly helpful (almost intrusive) Turkish people, but it has been a smidge difficult to get more than the bare minimum of assistance. Which is fine, because I respect it and I get it - if I held something as holy and revered, I wouldn't necessarily want tourists tromping around with cameras taking photos with it either - but at the same time, we've worked to be respectful and have done our research to try and make sure we're not intrusive. 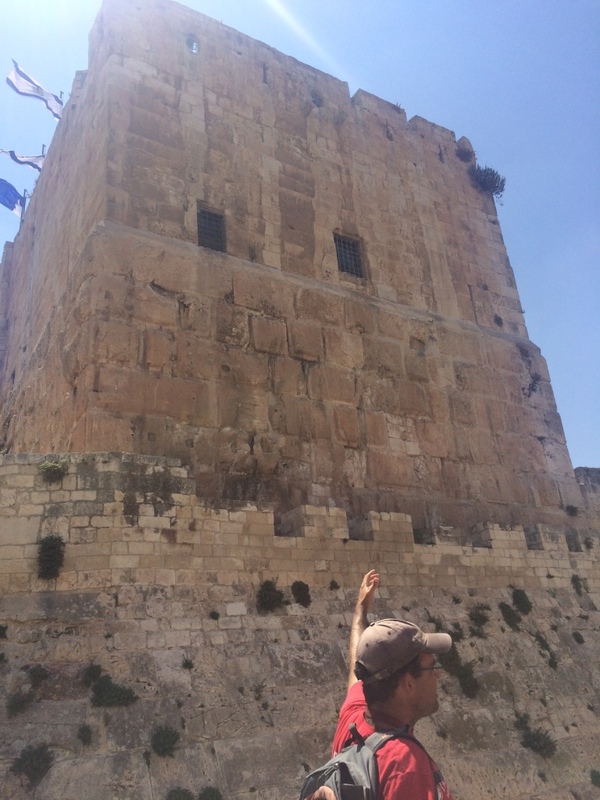 Our guide taught us that in Jerusalem, tradition trumps facts. Not in a bad way - for example, nobody knows archaeologically where Jesus was born or where he died, or where he was crucified. Most of the locations today have been due to hearsay way way back in the day. Case in point - Church of the Holy Sepulchre, where Christ was crucified. Way back when, Helena (Constantine's mother, a.k.a. the emperor who converted everyone to Christianity) wanted to find where Christ was crucified, so she asked the locals, who indicated a vague area. So that's where Helena built the church. There is no archaeological evidence or anything that can scientifically prove that is true, and no one even knows if she had the right area, but it doesn't matter - if the tradition says that's where something happened, then that becomes the new truth. And that's all that matters. (Like the example with the Tower of David as well. It was historically proven later that it wasn't the actual Tower of David, but that didn't change anything. 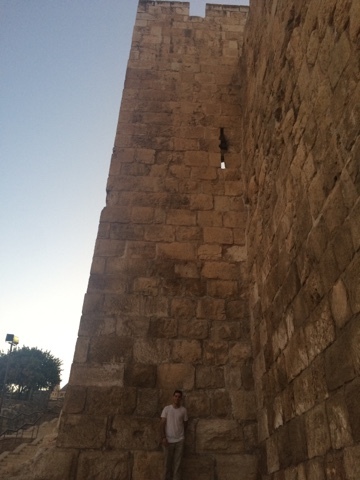 It is still the Tower of David today). This was the #1 thing our guide told us to take away from his tour. I should have known this given how many times my dad had us watch "Fiddler on the Roof" as a child. I mean, "Tradition" is the entire first number of that musical. There is an actual phenomena called "Jerusalem syndrome", where visitors become overwhelmed with all the holiness in the city, and start to believe they are Jesus/other biblical figures/or someone with an intense religious theme. Numbers range from roughly 100 people a year who befall this illness, and about 1/4 of them have never had any previous history of mental illness (!). They usually have to be hospitalized, and it typically goes away after a couple of weeks or after being removed from Jerusalem.